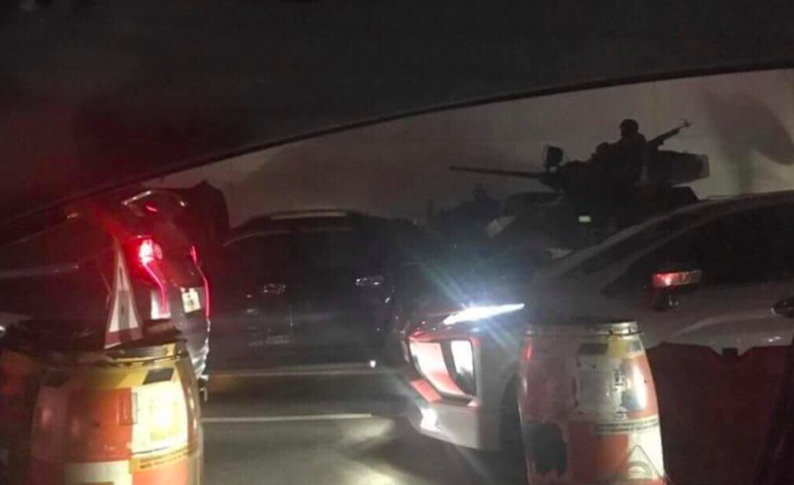 An army tank supposedly spotted on EDSA on Monday evening. Picture via Twitter. The Armed Forces of the Philippines has issued a statement denying a military build-up on the streets of Manila. Over the past few days, social media users have shared numerous pictures of tanks, military helicopters and other hardware in the capital. The supposed activity comes as Senator Antonio Trillanes remains holed up in the Senate following President Duterte’s proclamation revoking his amnesty for his role in previous coup attempts. The president has also spoken of receiving intelligence from a foreign power detailing a conspiracy against him. His spokespeople have made similar claims that the Liberal Party, the Communist Party of the Philippines and Senator Trillanes were working in cahoots to overthrow him. Today (Wednesday, September 12), the Armed Forces of the Philippines issued a statement on the official Philippine Information Agency website to counter rumours of a military build-up. There has been persistent queries from media about various observations that the public asks. From alleged sightings of tanks, to military helicopters, or even red alert status of military camps. Matters that are otherwise normal occurrences. We wish to categorically state that there were no such sizeable movements of military aircraft or armoured vehicles. And even if there were any in they past or in the future, those were or will be routine movements that are properly coordinated. These transportations may happen any time of the day or night especially in localities where there are military camps. Some are even announced to the public in so far as they will not compromise operational security. We urge the public to stay calm. There is no cause for alarm. With this goes our appeal to the public to stop spreading rumours or conjectures. They don’t help. They tend to sow misinformation, confusion, and worst — panic. The public should be wary of persons or groups who maliciously spread such rumours. ALSO READ: Deerhurst: Is Duterte still marching in step with his military? The Malacañang is yet to comment on the statement. Also today, the nation’s police chief, Director General Oscar Albayalde, said his force was “taking seriously” the president’s claim that unnamed critics were plotting his assassination. “When the commander in chief speaks, we have to take everything seriously,” he said. In a televised interview yesterday, the president claimed there was plot to assassinate him on September 21, the 46th anniversary of the declaration of martial law by Ferdinand Marcos. On previous occasions, the president has spoken of an assassination plot being orchestrated by the CIA. The CIA and its minions in the country are hard at work nowadays. Why are the streets in Manila tree-lined? Because Chinese soldiers like to march in the shade.